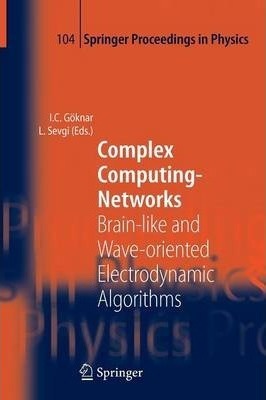 This book contains the ceremonials and the proceedings pertaining to the Int- national Symposium CCN2005 on "Complex Computing-Networks: A Link between Brain-like and Wave-Oriented Electrodynamics Algorithms," convened at Do ?u ? University of Istanbul, Turkey, on 13-14 June 2005, in connection with the bestowal of the honorary doctorate degrees on Professors Leopold B. Felsen and Leon O. Chua, for their extraordinary achievements in electromagnetics, and n- linear systems, respectively. The symposium was co-organized by Cem Goeknar and Levent Sevgi, in consultation with Leopold B. Felsen and Leon O. Chua. Istanbul is a city with wonderful natural and historical surroundings, a city not only interconnecting Asia and Europe but also Eastern and Western cultures. Therefore, CCN2005 was a memorable event not only in the lifetime of Drs. Felsen, Chua, and their families, but also for all the other participants who were there to congratulate the recipients and participate in the symposium. Illustrations note 16 Tables, black and white; X, 398 p.
This book uniquely combines new advances in the electromagnetic and the circuits&systems theory. It integrates both fields regarding computational aspects of common interest. Emphasized subjects are those methods which mimic brain-like and electrodynamic behaviour; among these are cellular neural networks, chaos and chaotic dynamics, attractor-based computation and stream ciphers. The book contains carefully selected contributions from the Symposium CCN2005. Pictures from the bestowal of Honorary Doctorate degrees to Leon O. Chua and Leopold B. Felsen are included. Electromagnetic Theory.- Wave Models for Networks and Fields.- Electromagnetic Field Interaction with a Transmission Line.- Scattering of a Plane-Wave by a Moving Half-Plane: A Full Relativistic Study.- High-Frequency/Short-Pulse Wave Dynamics in Ray-Chaotic Scenarios: A Survey.- Numerical Modeling and Simulation Studies of 2D Propagation over Non-flat Terrain and Through Inhomogeneous Atmosphere.- Fast Integral Equation Solutions: Application to Mixed Path Terrain Profiles and Comparisons with Parabolic Equation Method.- A Pole Matching Method for the Analysis of Frequency Selective Surfaces.- About Complex Extensions and Their Application in Electromagnetics.- Radiation of Sound from a Semi-Infinite Rigid Duct Inserted Axially into a Larger Infinite Tube with Wall Impedance Discontinuity.- Scattering by a Perfect Conducting Elliptic Cylinder Immersed Halfway Between Two Half Spaces.- Pattern Nulling of Offset Parabolic Reflector with Array Feed.- Tapered Dielectric Rod Antenna.- Design Alternatives of Spiral Antenna Arrays for Wireless Applications.- Analysis of Multiple Vertical Strips in Planar Geometries via DCIM-MoM.- A Matlab-based Filter Design Tool Using the Analogy between Wave and Circuit Theories.- A Generic Microstrip Structure with Broadband Bandstop and Bandpass Filter Characteristics.- Analysis of Waveguide Structures by Combination of the Method of Lines and Finite Differences.- Resonator Characterization by Microwave Active Circuits.- Performance Evaluation in Optical Burst Switched Networks.- Nonlinearity and Multiscale Behaviour in Ocean Surface Dynamics: An Investigation Using HF and Microwave Radars.- Fine Tuning of Printed Triangular Monopole.- A Chiralic Circuit Element and Its Use in a Chiralic Circuit.- Circuit Theory.- Dynamical Systems Analysis Using Differential Geometry.- r-Neighbourhood Impact on the Behaviour of 2D Cellular Automata Model of Complex Interactions.- Stability of CNN with Trapezoidal Activation Function.- Applications of CNN with Trapezoidal Activation Function.- A CNN-based Fingerprint Verification System.- Hardware Architectures for the Evolution of Cellular Automata Functionality.- Current Mode Double Threshold Neuron Activation Function.- Gradient Networks for Clustering.- On a matrix inequality and its application to the synchronization in coupled chaotic systems.- Rigorous Study of Chua's Circuit in Terms of Periodic Orbits.- Complex Behavior and its Analysis in Chaotic Circuits Networks with Intermittency.- Bifurcations in Noisy Nonlinear Networks and Systems.- When is a Linear Complementarity System Controllable?.- A Simple Artificial Neural Network Structure for Generating Chaos.- Advanced Signal Processing Algorithms for Wireless Communications.- A Clock-controlled Stream Cipher with Dual Mode.- Modeling Controller Area Networks Using Discrete Event Simulation Technique.- Degree Award Ceremonials.- Laudation on Professor Leopold B. Felsen.- Laudation on Professor Leon O. Chua.- Professor Felsen's Reply.- Photo Gallery.